It’s that time of year again, when it is hard to be inspired by the root vegetables at the farmer’s market. However, you can add a little goat cheese to anything and it solves most problems in the world, including “the winter that refused to end.” I hope you enjoy this recipe, as we (im)patiently wait for more exciting vegetables. This comes from Cooking Light’s April 2013 issue. Combine first 4 ingredients in a bowl, stirring well. Add radishes and oregano; toss to coat. Place 1 cup spinach on each of 4 plates. 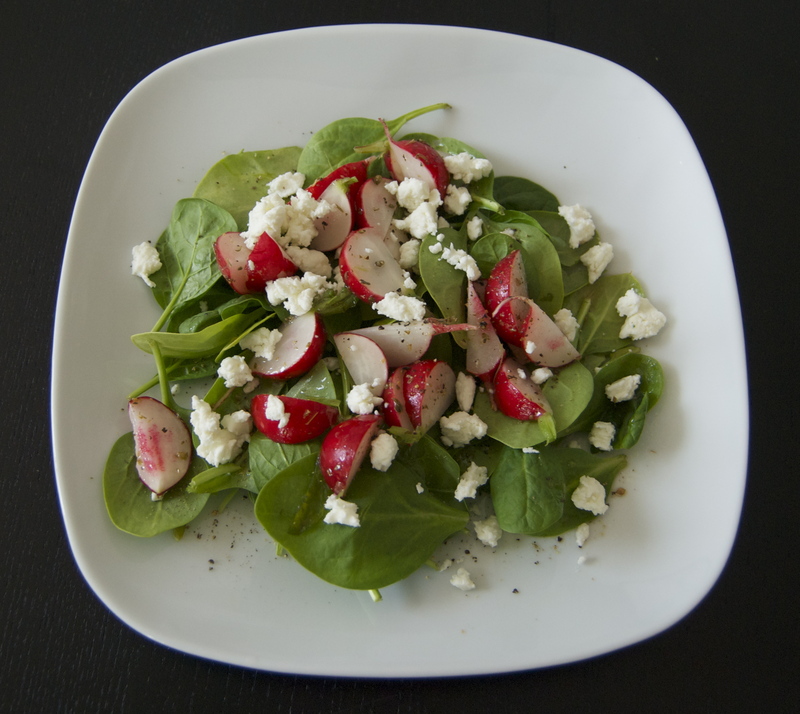 Using a slotted spoon, top each plate with 1/2 cup radishes. Sprinkle each serving with 2 tablespoons cheese and 1/8 teaspoon pepper. Drizzle remaining dressing evenly over salads. That is a perfect seasonal mix! Everything there came in our CSA this week. That’s great! Thanks for letting me know. I try to keep it as seasonal as possible.